Are you a retailer that understands your products need an online presence, but don't want to deal with the cost, time, complexity and likely un-profitability involved in operating an e-commerce store? Meet Locally Pages, Locally's amazingly powerful tool for retailers. Once your inventory feed is live on Locally, we make it simple for you to embed this feed onto your own website to broadcast the products you carry to visitors on your own website. This is called Locally Pages™. Locally works with our partner brands to support the catalogs so you don't need to clip a single image or product description. Every time we receive an updated inventory file from you via your inventory feed, we update your inventory (across the Locally platform, which includes Locally Pages™) accordingly, so it's automatically kept perpetually up to date. And if you're using a conversion tool like Hold or Pay Online Pick Up In Store, a shopper can complete their purchase through your Locally Pages™ tool, making Locally Pages™ the ultimate "L-Commerce" engine. Locally Pages installs in minutes, and is totally free for products from our partner brands. Why? This is part of a brand's subscription: providing their retailers with a highly robust way to market their in-stock products to their community. Read on for installation instructions and examples from other retailers. How do I install Locally Pages™ on my site? Installing Locally Pages on your own website is as easy as copy/pasting a snippet of code into your site, like dropping in a YouTube video. And, it's easy to customize the display to show inventory by brand, or by category, or by location. Read on for instructions on installing Locally Pages on your website. Contact us with any questions! It's easy to add your entire inventory presentation onto a single page on your website. Load your Locally subdomain- yourstore.locally.com- and under the "What's in Stock at [Your Store]" category grid, click the grey "Browse Stock" button. This loads a product grid with all items in stock at your store. Click the "</>" button on the lower left corner, and copy and paste the code that pops up. If you have multiple locations and want to show each location's inventory on it's own page of your website, this is the method for you. For example, load www.diamondbrandoutdoors.com and hover over "Shop" on the main menu. Select one of their two locations, and you'll see the inventory for that chosen location. Start by loading your Locally subdomain- diamondbrand.locally.com- and select the specific location you'd like to embed by clicking "locations" and then selecting that store's tile. This will load a page with a url along the lines of yourstore.locally.com/store/XXXXX. This means you're on the right track. Under the "What's in Stock at [Your Store]" category grid, click the grey "Browse Stock" button. In the resulting product grid, you should see that store as a filter option. Hit the "</>" button on the bottom left and copy/paste the embed code. 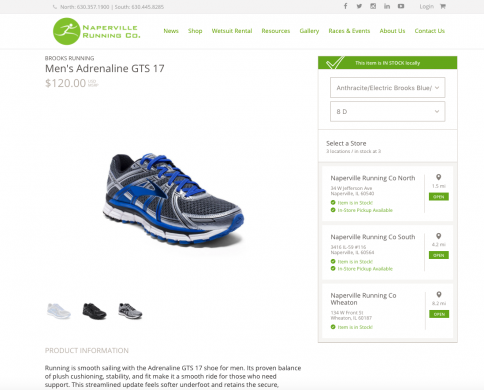 If you have multiple locations, you can add all inventory into a single page of your site, and the product page will show which of your locations have the item the shopper is looking at. For example, load runningcompany.com/shop/. If you select a product that is in-stock at more than one of their three locations, the product page will show the available options. To do this, load your locally subdomain- for ex. 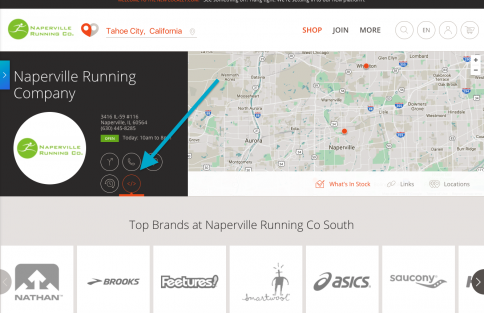 napervillerunning.locally.com- and click the "</>" button at the top of the page next to your store logo and the icons for phone, directions, etc. Grab this code and embed it onto a single page of your website. Customize your display by brand, category, or more. It's really simple to customize how you install Locally Pages to have dedicated pages for specific brands, categories, or even specific products. Here's all you need to know. Start at your Locally subdomain- yourstore.locally.com- and click the grey "Browse Stock" under your category grid options. Any filtered view you create here can be embedded into your own site by selecting the filters and then hitting the "</>" embed button. The code that is generated will automatically absorb the filtered view you've selected. 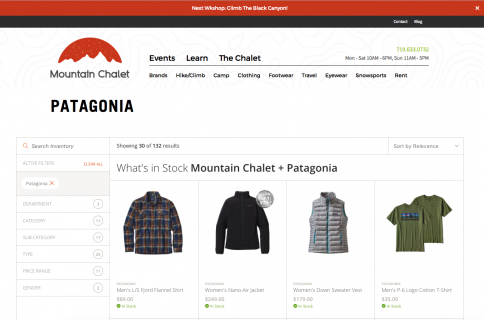 So if you're an outdoor shop and want to embed your Patagonia products onto their own page, you could do what Mountain Chalet does. 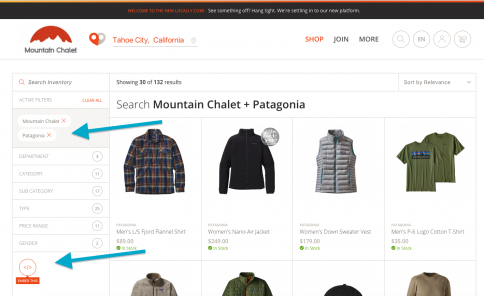 Load your product grid and select "Patagonia" as a filter option. Hit the "</>" button on the bottom left, and the code that pops up will be for all of your Patagonia products. Try it out! Load mtnchatlet.com and click "Brands" in the top nav. Hit the Patagonia logo and see their in-stock Patagonia selection. 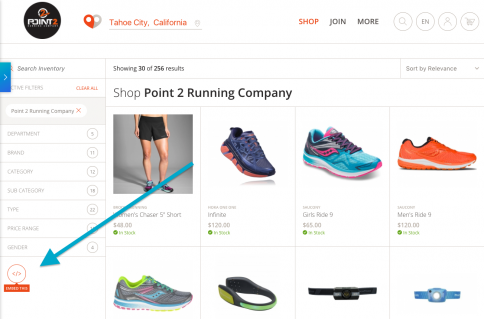 Want to let shoppers browse your inventory by category? No problem. 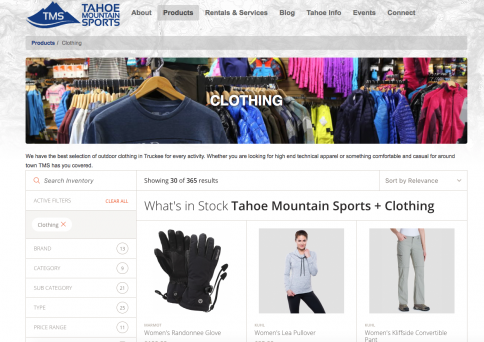 For example, load tahoemountainsports.com/products and see how you can browse their inventory by category. To do this, load your store's locally subdomain- for ex. tahoemountainsports.locally.com- and select a category tile or hit "Browse Stock." What are some examples of retailers using Locally Pages™? 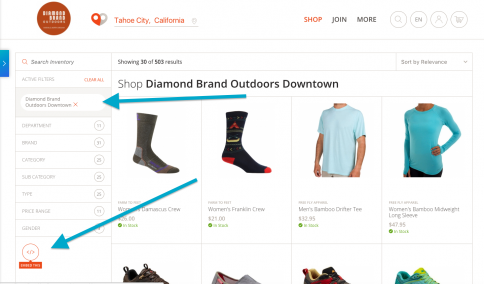 Dozens of retailers in outdoors and running are using Locally Pages™ to broadcast what they carry on their own websites. Appalachian Outfitters: to provide users with an in-depth shopping experience, they set up Locally Pages™ by both category and by brands. Mouse over "Browse Store" on their site and select a category. There, you can browse that category by brand to see what they carry. Shoppers can place any of these items on hold for in-store pickup. 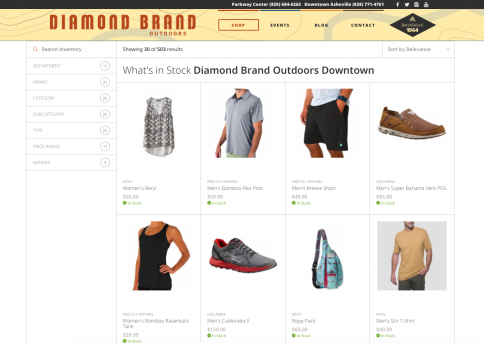 Diamond Brand Outdoors: Diamond Brand Outdoors has two locations, so they designated a page for each store's Locally Pages™ tool. A user can click through and browse what's in stock at each of their stores, and put any item on hold for in-store pickup. 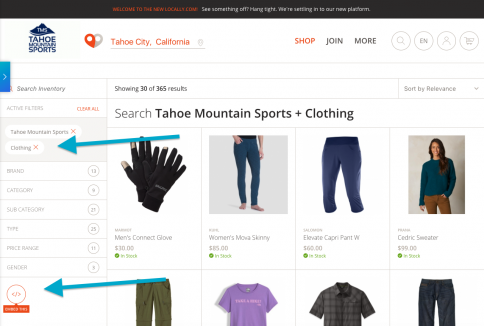 Mountain Chalet: Mountain Chalet has built Locally Pages™ into their site in a powerful way, allowing shoppers to refine their search down to the specific activity/category they're searching for. Big River Running: Big River Running uses multiple instances of Locally Pages™, one for each location. They also accept reservations for in-store pickup every day. I do E-commerce. Can I still use Locally Pages™? Yes! Locally Pages™ comes in handy particularly for companies with multiple locations whose site is primarily focused on e-commerce. By using Locally Pages to also show visitors what is in-stock at each location, you can provide a robust, omni-channel experience on your site in minutes. Massey's Professional Outfitters is a great example. Their website is primarily e-commerce. But, if a shopper clicks on one of their location pages, they see what's in stock at that location and can put anything on hold for in-store pickup at that store. Does Locally Pages™ work if I have multiple locations? A true, multi-location Locally Pages™ widget will become available in future updates. Until then, if you are a company with two or more locations, we recommend you use Locally Pages™ by embedding each store's Locally Pages™ onto its own page of your own site. 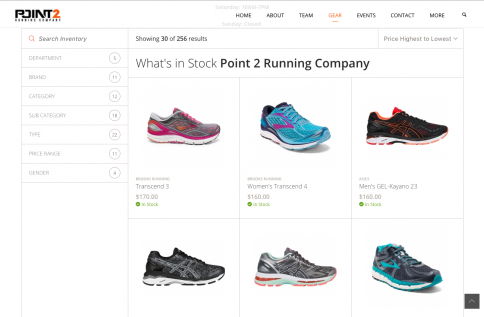 A good example is Naperville Running Company, a two-location company who has a page for each of their locations. Another good example is Massey's Professional Outfitters, who's site is primarily e-commerce. But, if a shopper clicks on one of their location pages, they can see what's in stock at that location and put a product there on hold at that location. Why can I click through to the product page for some brands, but not for others? When you install Locally Pages™, you'll notice that some products can be clicked on and viewed on your own site, and others require the visitor view that product on locally.com. Visitors can click through to any product on your site if it is a product from one of Locally's partner brands. As partner brands, making their catalog available for retailers to embed on their own site via Locally Pages™ is one of the services they are providing to their dealers. Locally also offers catalog support for a select group of non-partner brands. We choose to support additional catalogs based on popular demand. If you have a brand that isn't a Locally Partner Brand but want to be able to support their products, let us know and we'll determine how to support that brand. For products from non-partner brands., you can still display these products as in-stock, as long as we're matching the UPCs. But, if a visitor wants to click through to see product details, they are taken away from your site and to locally.com. The best thing you can do is contact the brand is question, tell them you're participating in Locally, and would love to see them do so! Currently, every product on Locally Pages™ uses MSRP as the price. However, we will soon release support for allowing a retailer to customize their own prices to reflect sales, in-store promotions, etc. on their Locally Pages™ tool. I'm a running shop. Why are some of my brands not showing up? Locally guarantees product coverage for our partner brands. These brands are actively working with us to support this experience and provide us with their complete product catalog so that when you send us a UPC for their brand, we match it to a complete product presentation. If a brand isn't working with Locally yet, we attempt to piece together their product catalog by scraping the web, but this is an imperfect process that means we miss a ton of products, aren't totally happy with the product presentation, and your shoppers have to view those products on locally.com instead of your own site. This is meant to be a stop-gap solution until we can formally work with that brand. If you have a brand you want to display that we're not currently working with, please tell that brand that you are using Locally and would like to see them on here. A bunch of brands are also currently in the on-boarding process. To get a status update on which brands are coming online soon, please contact us at retailers@locally.com.